Last night I hit a deer at about 40 miles per hour in a densely populated suburb. I’m not sure if I saw it first or simply heard the sound of the deadening collision first, but either way there was no chance for me to swerve, break or otherwise react. All I could do is shout, "Oh (shucks)!," quickly slow down, and pull off the side of the road. After colliding with my driver-side headlamp, bumper, wheelwell and hood, the poor animal was launched 8 feet to the road’s opposite shoulder. The deer’s untimely end seemed immediate. The overpopulation of deer is a huge problem. While some animal-rights activists seek to greatly restrain hunting and birth control methods, each night deer die cruel and painful deaths on our roads and highways, and countless people suffer injuries and financial hardships from collisions with deer. Our cities and suburbs should pursue effective methods to reduce the deer population to keep both animals and people safe. About 20 minutes after the accident, while a police officer was writing the accident report, a pick-up truck pulled over. Out stepped a young woman in a prom dress. "Did she need the police?" I wondered. "Perhaps she saw the police car’s lights and decided that she needs to get away from an abusive or drunk prom date. That’s it. She was driving down the road and stopped her truck to get away from her good-for-nothing boyfriend. Good for her," I thought. "Is the police officer around?" she asked. "Yes, he’s over there writing up an accident report. I just hit a deer." Without any other words or expression, she walked straight to the police officer’s SUV. Moments later she came back to me, "Are you alright, sir? I’m an EMT. Any pain, headaches, backaches, pains anywhere?" I replied, "No, but thanks for asking." "Alright. Have a good night, sir," and she walked back to her truck and she was off to continue her prom night. The police officer later explained that Pennsylvania EMTs (Emergency Medical Technicians) are required by law to stop at the scene of any accident they witness or happen upon, whether or not they are on duty. Thus our EMT in a prom dress was simply doing her job. How wonderful. Thank you. The end of this story could have been very different had the deer hit my door and window, or worse yet – had the deer hit the driver-side rear door and window, where my 2-year old daughter was sitting in her car seat. I’ve heard of situations where deer have crashed through windows, greatly injuring people in the car. I’m just thankful that my daughter and I are alright, and grateful for the service of the police and EMT in a prom dress. What a night. This entry was posted in Etcetera. Bookmark the permalink. C, I’m so glad you and T are all right. We think my brother died swerving to miss a deer, so as sad as the deer’s death may be, it’s certainly the lesser of two evils. Hope the car is okay, too. How scary. I’m glad you are fine. That is an “inches” thing, like in baseball, but with greater consequences. Apparently there are too many deer everywhere. In the suburbs, it is hard to control the population because it isn’t a safe place to hunt. But people around here hunt and we have wolves, and there are still way too many deer. When they are out in the yard in day light in groups of 3 – 6 and don’t run away, that is TOO MANY and they are too tame. Not a natural situation. Many years ago, the City of Philadelphia planned a deer hunt to reduce the deer population of Fairmount Park. There was a huge outcry. At one public hearing on the matter a woman asked if the park rangers might try birth control to reduce the population rather than a hunt. A straight-faced ranger replied that they had tried placing birth control throughout the park. The program was unsuccessful, he reported, because the bucks had hooves and were unable to get the quarters into the slots of the condom machines. You’ve got to love a civil servant with a sense of humor. On a more serious note, I’m glad everyone is all right. 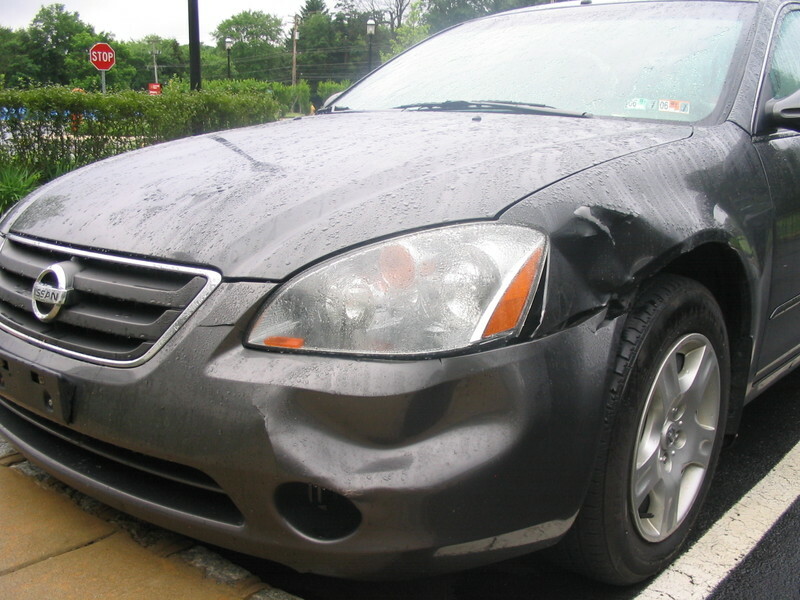 If it’s any consolation, you care has relatively minor damage for having hit a deer. The deer problem will only get worse as the suburbs devour more and more of the woodlands and farmland around cities. Loss of habitat increases these encounters between man and deer. Glad to know you and the sweetie are good to go. And I agree with John, the car looks great considering you hit a deer. Have you ever thought of getting one of those whistle things you put under your hood to scare the deer away? They’re big sellers up in the UP and Wisconsin. 😉 Never knew your neck of the woods was so filled with flora and fauna. Glad to hear you are both ok. There is nothing quite so startling as hitting an animal that somes from out of nowhere. A few years ago I went to visit my mom and we ended up at my grandmother’s house, where the smell of deer meat wafted around the kitchen. Knowing that deer weren’t in season at the time, I asked if it where left in the freezer from the hunt last year. I was informed that my cousin had hit a deer on the way home from work, and the cop that came to the scene of the accident told him he was free to keep it. The moral of the story is this: as much as I like to downplay prejudices and stereotypes of southerners, I can only do so much considering I ate road kill that night! Thinning the herd through hunting is a great idea, especially since it is a public safety issue. For those who are against it because they think hunting is inhumane, I would suggest they visit a slaughter house, and then accompany a hunter. I can honsetly say that the animals I have killed while hunting suffer far far less than those who go through commercial slaghter houses.